Tem sido mais frequente darmos aconhecer novo projectos na área do netaudio do que anunciar o final de outros, mas no espaço de apenas dois dias é a segunda vez que anunciamos o fim de uma netlabel. Depois da Autoplate, desta feita é a vez da russa Top 40 - que ao longo dos últimos 4 anos disponibilizou 40 edições em áreas musicais tão distintas como "microwave, glitch, dancehall techno, ambient, field recordings, drones, mellow , contemporary jazz, modern classical" - cessar o seu percurso editorial. We were waiting for this moment for a long time and now we're about to close a significant chapter of our life. The following brief story is somehow quite personal, but it's important to share it with you, because your contribution to the success of Top-40 by no means is less than ours! You downloaded our releases, you enjoyed our music, you supported us, you hailed us, you criticized us, you visited our concerts. But you never stayed impartial. You always care. And that makes the whole story true. Top-40 label was established by Motor in 2002. The same year I bought one of his releases, which impressed me very much («horse traX» album). In August 2004 we met by accident at the videoart festival in Moscow. 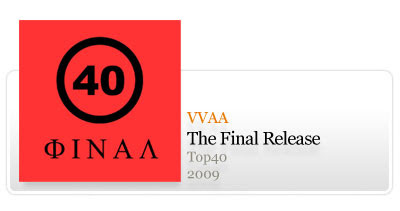 In December, Motor launched Urban Soundscape audio-visual experimental festival, and in April 2005 released the first online album at Top-40. Then he invited me to join the team. We explore the realms of many genres — instrumental and electronic, radical and calming, traditional and experimental — from ultra minimalistic ambient, field recordings, cut-up collages, groovy dub-techno, drones or industrial dance music to crunchy melodic glitch-pop, minimal electronica, rhythm'n'noise free improvisations, experimental tribal, noise, dancehall techno, modern classical, avantgarde, contemporary jazz and so on. In December 2005, Quiet Zone was born, which is now an independent project, dedicated to very minimalistic and quiet meditative music. Humming rises, tremendous throw-downs... We made our way through it all. And now finally we're standing at the terminal point. Almost four years. Forty releases. More than 28 hours of weird music. It was always about bringing your life with joy. And we believe we succeeded. Eighteen wonderful songs from outstanding artists — old-timers, newcomers and some never-heard-before stuff too. Enjoy, and remember — we can't stop the music! You may wonder — ok, and what's next? Is it the end of the story? For as long as you need our music, we're not gonna stop. We already have a lot of wonderful material we can't wait to share with you! Upcoming year will bring a new story, new decorations, new surprises and of course tons of new music. Stay with us.